Colours Available: Fair, Light & Medium. 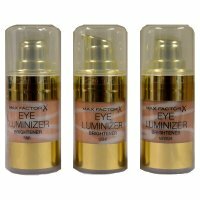 Eye Brightener Covers Dark Circles, Immediately Rejuvinating Eye Area. It Hydrates Delicate Under-Eye Skin, Helping Make It More Radiant Over Time. A Healthy-Looking Glow Can Really Lift Your Look. It Cover Imperfections & Give Flawless, Even Coverage.